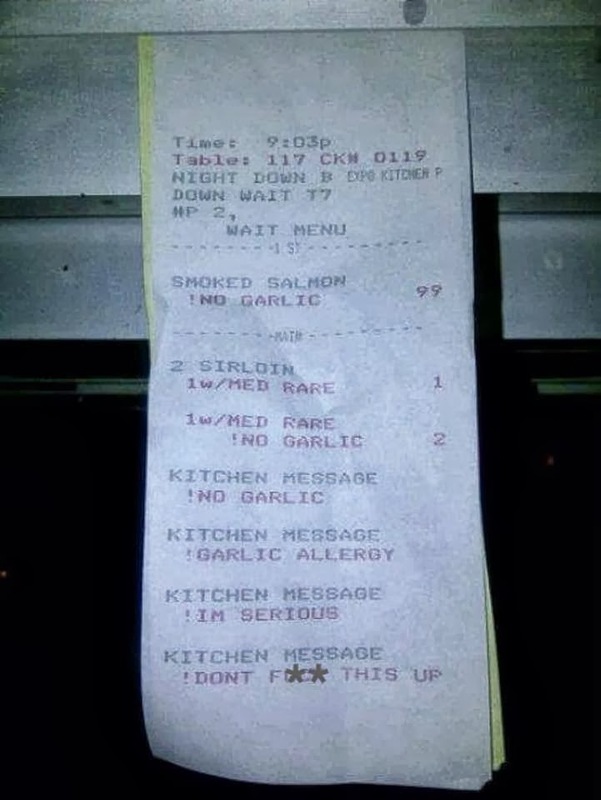 This server took it upon themselves to ensure that the kitchen staff took his customer’s food allergy seriously! Do you think the last line caught the chef’s attention? Would you give a bigger tip??? I can't say how often I have done this exact thing for customers I have waited on, and believe it or not, it almost NEVER results in a larger tip. Its like they come in with the mentality that we have to accommodate them or else. I've honestly never minded. I love to go above and beyond the norm to take care of guests, but when a guest can't even verbally thank me, I get tired of trying to help. That is so unfortunate! After reading the comments on my Facebook page, and of those that shared this posting, the majority of all people said they would increase their tip. Keep going above and beyond…it is noticed by most. These things never result into a larger tip. What really matters is your food and services quality. The staff must be pleasing and should listen to the customer properly. When you treat your customers well, you would definitely get something in return. During my visit to Ireland, I went to a restaurant in Limerick http://www.cornstorerestaurantslimerick.ie/, there the staff was very pleasing and the food quality i Got there was amazing. What really matters is the quality of food and services you provide to your customers.